Our MCA-66 is a 6-source, 6 zone controller with a built-in 12-channel amplifier with up to 60 watts (stable to 4 ohms) of stereo power per zone. Add KC6 or KC7 keypads for a feature-rich, great sounding system. Each zone independently selects the source it wants to hear. Add a GW-SL1 gateway to wirelessly control via smart phone or tablet. The MCA-66 is the most affordable all-in-one whole-house audio controller/amplifier available that includes these features and this high level of build-quality. Add a KC6 keypad into each zone and/or use a computer with the built-in RS-232 interface to send and receive signals to and from the controller. Easily connect up to four 8-ohm speakers into any zone and add even more through the use of unlimited sub-zones. 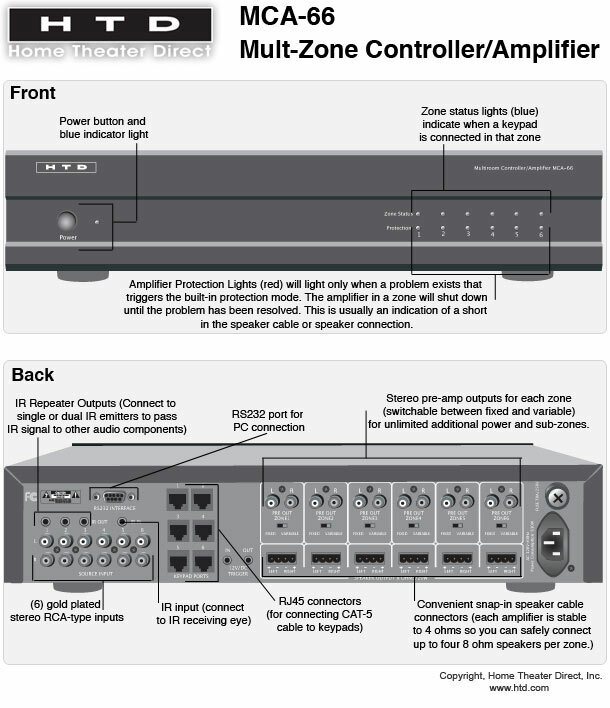 Each zone includes pre-amp outputs so that you can easily add additional amplifiers and speakers into any zone. Sub-zones hear the same source selected by its parent zone, but volume can be controlled either 1.) by the parent Keypad, or 2.) independently by setting the preamp output to "Fixed" and adding regular rotary volume controls. If you need more than six unique zones, simply add an additional MCA-66. In fact, there really is no limit to the number of zones and sub-zones achievable with this system. The MCA-66 gives your home a high-tech and easy-to-use way of controlling the audio ambience throughout different zones in your home. A whole-house audio system will add value to your home and with our low direct pricing, it's an especially good investment. Dimensions (HxWxD): 4" x 17" x 17 1/2"